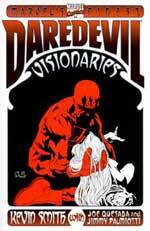 By Kevin Smith, Joe Quesada and Jimmy Palmiotti, this first tale from Volume 2 under the Marvel Knights banner had Matt Murdock dealing with a separation from Karen Page, and a mysterious guest who may be the cause of a battle between heaven and hell. Except for some odd character moments, this was a decent DD story. The choice of villain was interesting and different which made for an entertaining battle at story's end. Q's art really helped elevate the story. I rate it a 3. Dreck. Plot holes all over the place, too-cool-for-school dialogue and a lame ending that finally laid bare that Smith had no idea what he was doing from the get-go. Of course to top it all off Smith kills Karen just so this dumb story will have lasting significance. Altogether pathetic. So why can't you see the funny side? Care to elaborate on the plot holes and what about the ending you don't like? Not being confrontational, just never heard anyone specifically state what they don't like about Guardian Devil. I re-read the thing a few years ago and wrote a large post about it then (in basic disbelief that anyone still considered it passable let alone good). I tried to find the post but couldn't. In any event, I remember there being tonnes of little stuff, plots holes and stuff that bugged the heck out of me. One example that killed me was the shot of the Kingpin saying "nicely done" or something when he reads about Bullseye killing Karen. Seems like it makes sense because it's Kingpin being impressed that Bullseye killed Karen; it was a good way to get at Matt. BUT, Bullseye didn't kill Karen on purpose (as in he didn't hunt her down or anything) and he certainly didn't do it as an attack on Matt. She just shows up and he kills her because that's what he does. So what? Well, the problem is that now the shot of the Kingpin is actually a shot of him being mistaken; of him misreading the situation. Sure, the Kingpin could be mistaken but why are we being shown this? Why did Smith, who knew all this put that in there? Because he's both stupid and sloppy, that's why. There's a tonne of other stuff in there like that. Oh yeah and the AIDS thing? What was that about? Karen shows up and says she has AIDS but then she doesn't but did? As for the end, it comes down to this: literally anyone could have shown up when Mysterio did. The point of fiction or drama or whatever is that you're supposed to be rooting for something and against something. Usually it's really neat when there's a twist ending or whatever and then you can go back and see all the clues you missed. There were no clues. Mysterio just bombs in from the sky and drops a bunch of exposition and then dies. That's not interesting in the slightest. On a more personal dislike level, I couldn't stand all the name dropping, etc.. Like characters mentioning Dazzler or Mysterio mentioning Kraven. It was like Smith was jumping up and down trying to show off all the Marvel lore he knew. I know this is kinda his thing since all of his fans seem to be obsessed with being in the know and exclusive and whatever but if you're not into that (i.e. you're not 13) it wears pretty thin pretty quick. So, yeah. That's why it sucked. There were a lot of things that bothered me about this story, but I think one of the biggest problems I had was with Foggy's non-reaction to Karen's death. I know he had his own problems (framed for murder, girlfriend leaving him), but this was still one of his best friends and the girl he once loved. I don't think he references it beyond "How was the funeral?" after rereading the story, so many things didn't fall into place in the story. Mysterio choose DD instead of spidey for his "swan song", because spidey let the role to scarlet spider, and then, at the end of the story, Peter Parker was there and try to comfort Matt after the loss of Karen... The true Spiderman returns (and was returned for a while) but Mysterio choose to stay with his replacement instead of his original choice. Clever and logical. Very very bad writing here. I don't like fall from grace which has too much things happening at the same time and which isn't very emotional to me, but the story is coherent and Chichester knew where he went with the story. It isn't the same with guardian devil which is a bad "born again" knock off with the name "Kevin Smith" on the cover to be sure that the comic sell. Sad.